Ice cream sandwiches have come a long way from those plain chocolate cookie and vanilla ice cream treats so many of us enjoyed as kids. Simple cookies have been replaced with everything from salty crackers to baked goods to fresh fruit. And the ice cream options? Even more incredible! 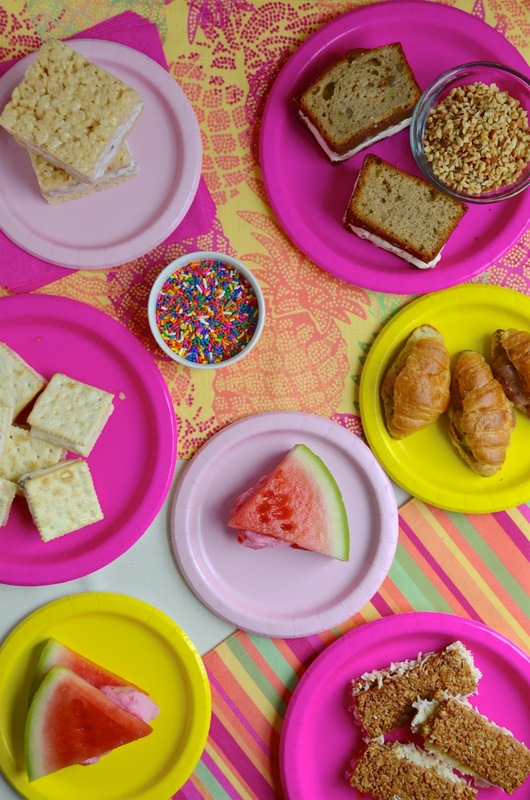 I'm so excited to have teamed up with Walmart this month to put together this epic ice cream sandwich guide for you featuring six fun ice cream sandwich ideas. From kinda fancy dinner party-ready treats to ones the kids will love, there is something here for everyone. All the flavors featured in these easy recipes are from Walmart's Great Value line of ice cream, sherbets, and frozen yogurt. These are available throughout the country and come in a bevy of different flavors with super clever names like "Break-Up Brownie" and "Legend Cherry"
I tried them for the first time last month at an event, and was bowled over by how good they are. Super creamy with great flavor and the perfect balance of sweetness. I think a lot of times people assume store brand items are lesser quality, but these give those famous brands a run for their money. You want to know how much of a fan I am? This post was originally only supposed to have featured 3 recipes, but there were seriously SO MANY great flavors that I couldn't limit myself and ended up doubling it. Scroll down and let me know what you think about these ideas--I'd love to know which one you want to try first! 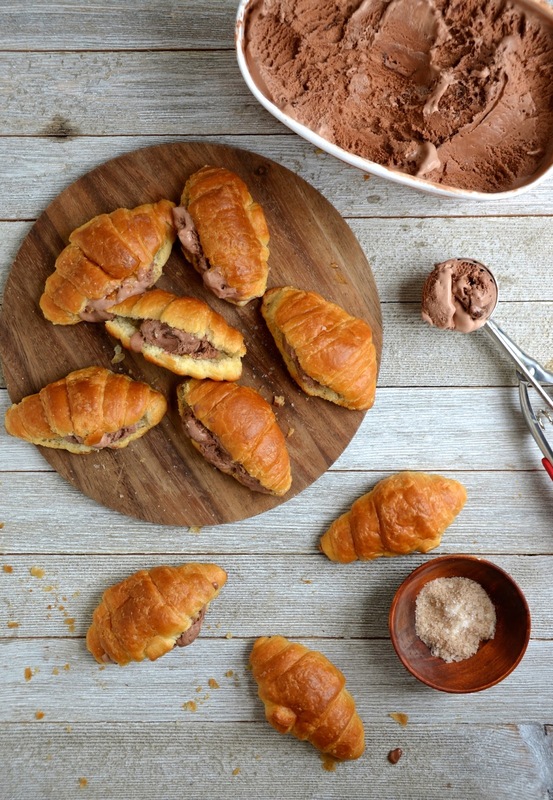 This is summer's answer to those warm chocolate croissants. 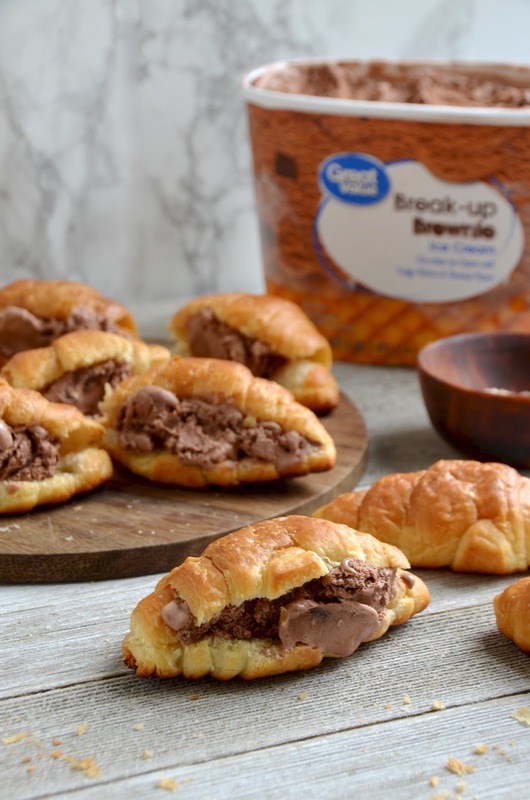 Mini buttery croissants stuffed with a generous scoop of Break-up Brownie ice cream (aka the most perfectly named ice cream flavor ever), topped with a tiny sprinkle of fancy sea salt. You can make these with full size croissants if you prefer, but I think the mini ones are adorable and make for a perfect portion size after a big meal. To make them, I picked up a bag of mini croissants from the bakery section at Walmart, and then brushed them with a little butter and baked at 350 degrees for a few minutes just to toast them up a bit. Let cool, then fill with a scoop or two of ice cream. The flaky sea salt at the end is the perfect finishing touch to balance out all the flavors and turn these into the chicest ice cream sandwiches around! Note: you can make these up to a day in advance, but take out of the freezer about 20 minutes before serving just to let the bread soften up a bit. I first tried Sour Pucker Punch sherbet at a mini ice cream party the folks at Walmart hosted for my blogger friends and I during our visit to their Arkansas headquarters. The sherbet is a combination of creamy raspberry sherbet with a tart sour raspberry ribbon reminiscent of those super sour gummy candies we all grew up eating. It's one of those flavors that admittedly sounds a bit weird until you taste it, at which point it totally makes sense. It's sweet and sour; creamy and yet also kind of refreshing. There's not much I can say to do it justice; try it for yourself and you'll see! And when you do, might I suggest this super unique ice cream sandwich alternative? 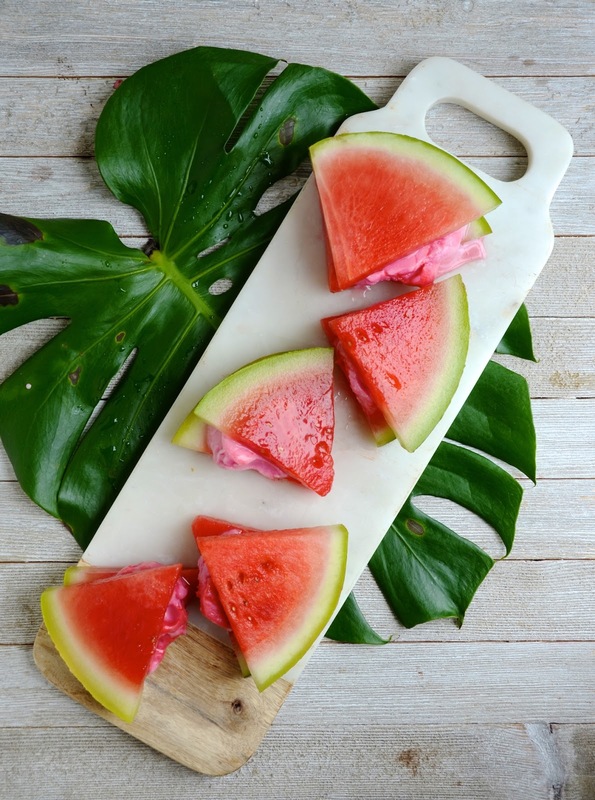 The sherbet is perfect sandwiched between slices of fresh watermelon. It's an easy and totally different take on summer desserts that your family will love. Note that this is one of those treats that really needs to be made and eaten right away. 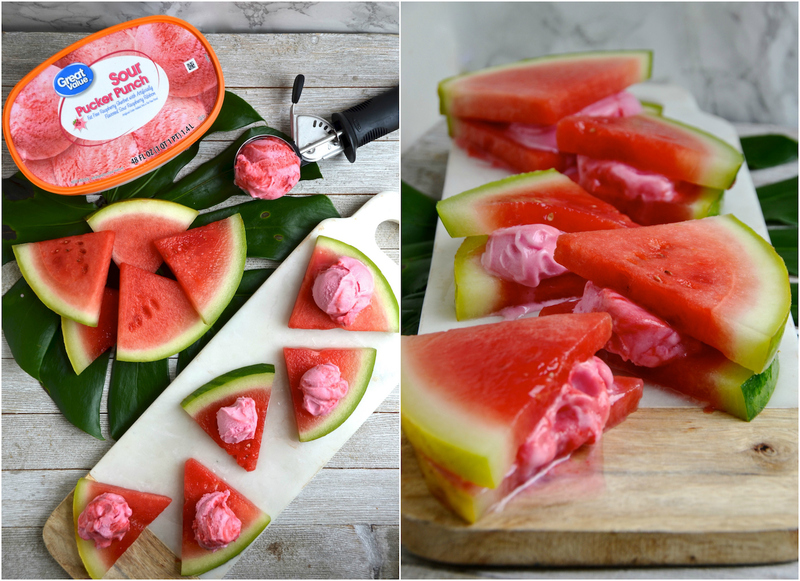 If you're entertaining, I recommend slicing the watermelon in advance and keeping chilled in the fridge. Then pull out the carton of Sour Pucker Punch, and assemble right at the table, letting friends grab their portion as you go. Where are my fellow salt lovers? If you're a salty-sweet fan, meet your new favorite ice cream sandwich. 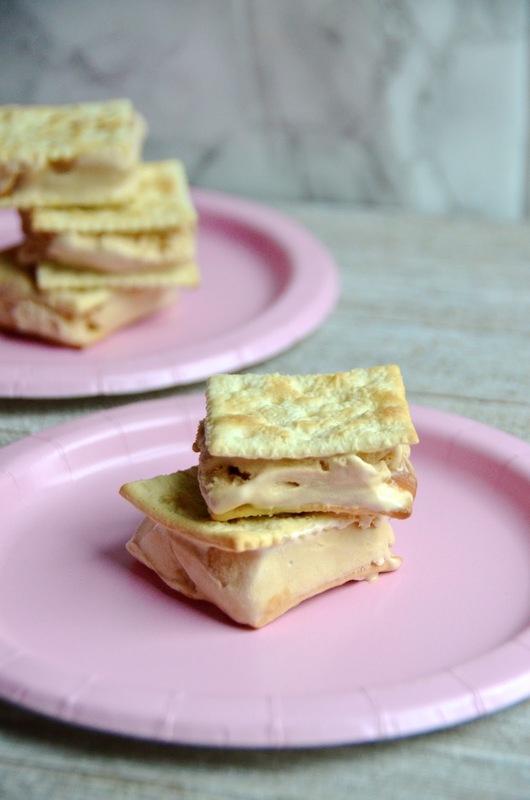 Salty, crispy saltines are an ideal match for luscious salted caramel ice cream. I actually think crackers are leagues ahead of cookies when it comes to ice cream sandwich magic. 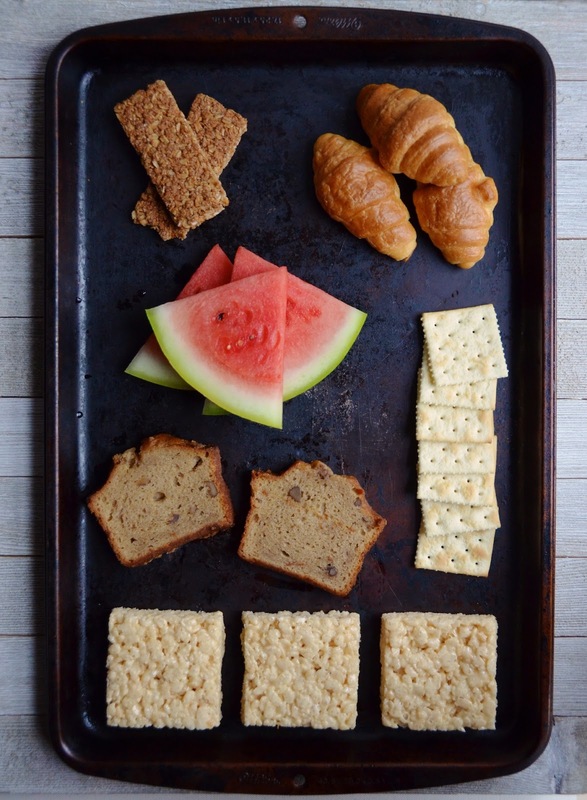 To make these, arrange a dozen or so saltines with the unsalted side facing up on a parchment or plastic-lined tray. Then use a small cookie scoop or tablespoon measure to scoop out dollops of ice cream per cracker. Top with other crackers and smoosh down a bit to close. Pop them in the freezer and let freeze for at least 3 hours (or even overnight). I love how creamy and soft the Great Value Down By the Sea Salt Caramel flavor is--it almost reminds me of soft serve, and the delicateness makes it perfect for sandwiching between the fragile saltine crackers. It's also the perfect balance of sweet ice cream and salty caramel--definitely one of my favorite flavors by far! Tuck a scoop of your favorite ice cream flavor between two marshmallow treats and enjoy! I used Legend Cherry, which is a mix of some of my favorite dessert-things: cherry, amaretto, and fudge! These are one of the easiest sandwiches to makes since the treats are sturdy and freeze really well. After you assemble them, pop into the freezer for 3 hours to set, then wrap individually in plastic wrap. These will keep well for a few days (pop them all into an air-tight container to keep them even longer) and are perfect for grabbing as an after-dinner treat on hot summer nights. Bonus tip! 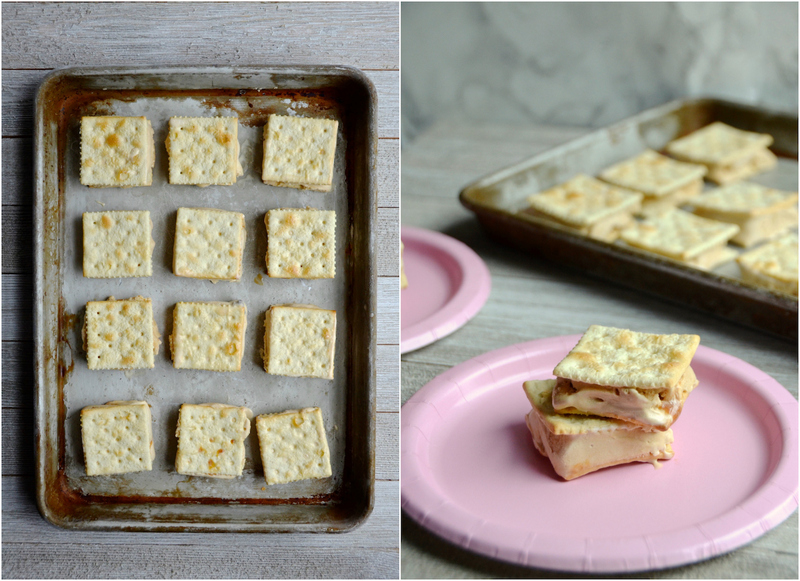 To save time, I used a package of store-bought marshmallow treat squares I found in the snack aisle at Walmart. They're the same store brand as the ice cream (Great Value) and come precut and individually wrapped, but are soft and gooey just like the homemade ones. This is basically an island vacation in ice cream sandwich form. 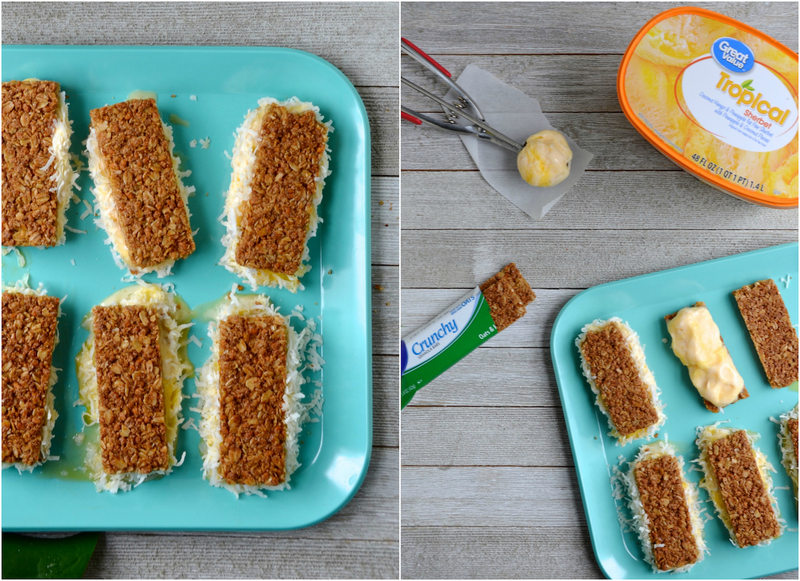 Crunchy honey granola bars and super summery tropical pineapple/mango/coconut sherbet. This flavor has shredded coconut and pineapple chunks in it, but I also love rolling the edges in shredded coconut (because there is no such thing as too much coconut!). 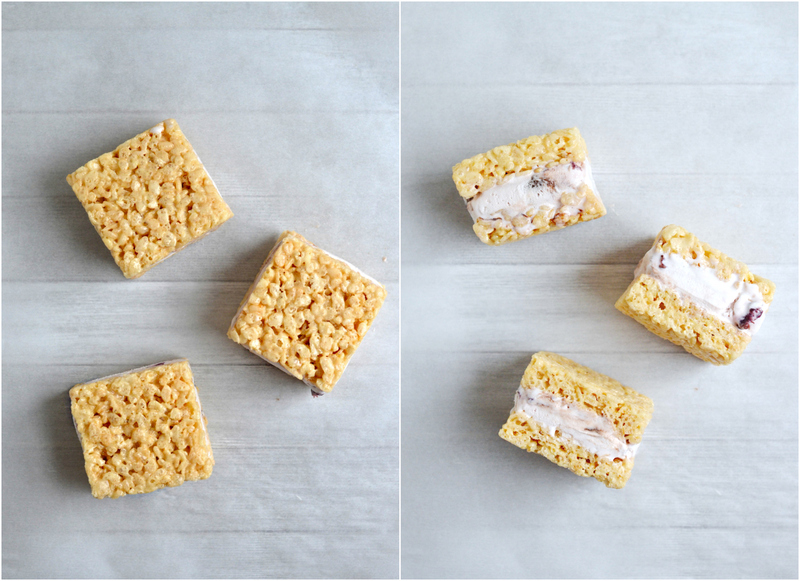 The slightly tart sherbet is a good match for the sweet and slightly nutty granola bars. It's a nice mix of bright and summery, with sweet and wholesome. Note that because of their higher fruit juice content, sherbets and sorbets melt quicker than regular ice cream, so this is another idea that should be assembled and eaten right away. The soft sherbet spreads easily so these come together really quickly and will be a welcome treat at any summer party. This is the kind of ice cream sandwich you could totally justify eating for breakfast. Not every morning, mind you. Definitely not before a big test or a marathon or anything like that. But maybe on your birthday or the last day of summer vacation or some other special morning. This would also be a totally awesome brunch dessert. 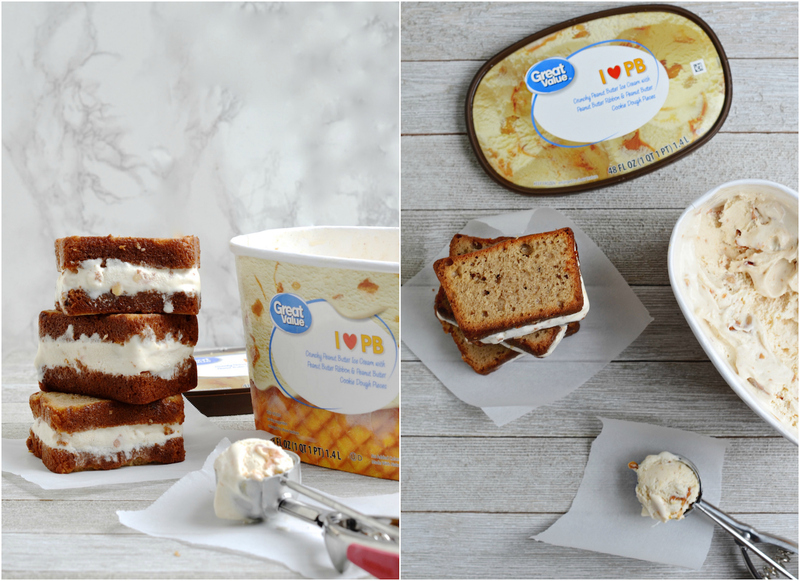 To make, slice thick slices of banana bread (again, make your own or hit up your bakery for a loaf or two) and top with generous scoops of I Love PB ice cream (which features peanut butter ice cream, a peanut butter ribbon, and chunks of peanut butter cookie dough!). Top with another thick slice, smoosh, and eat! 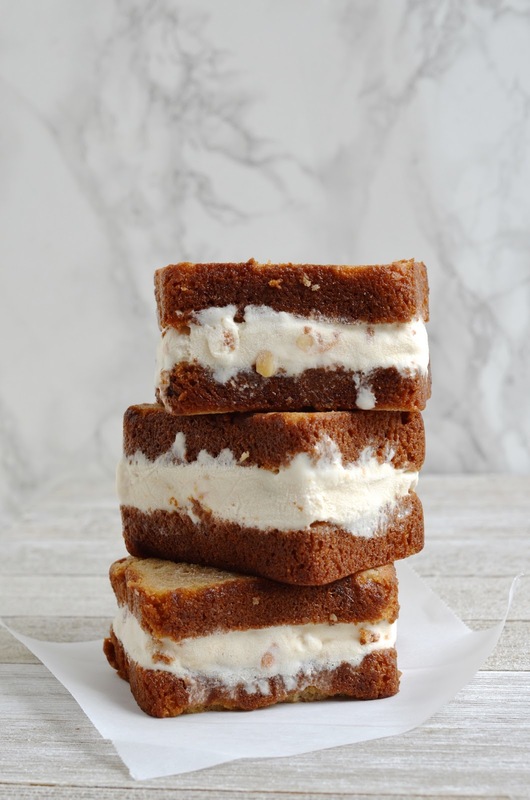 Like the marshmallow treat version above, these banana bread ice cream sandwiches freeze really well and are ideal for making in large batches for parties or snacking. I recommend wrapping them individually then tucking into an air-tight container before freezing. And there you go! 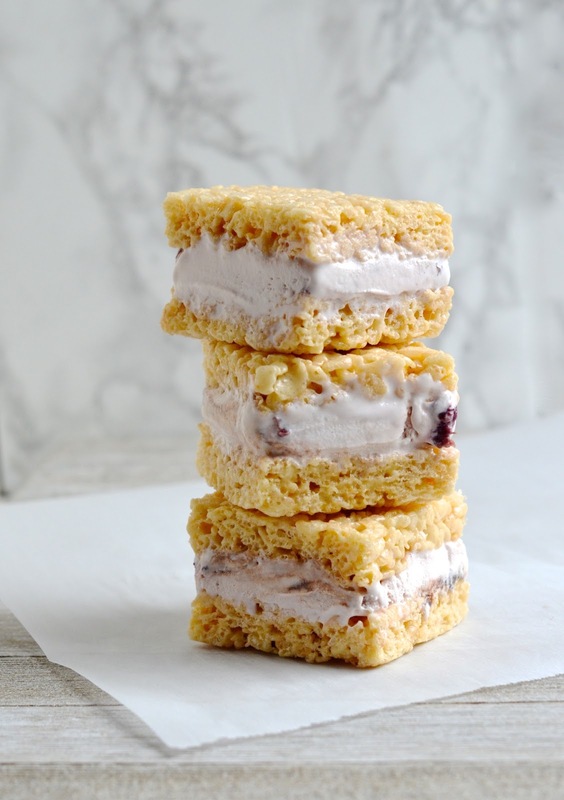 Six super fabulous ice cream sandwich ideas to enjoy all summer long! Which flavor combo are you going to try first? This post is a sponsored by Walmart. As always, I only work with products and brands that I genuinely love, and would happily recommend and serve to my own friends. 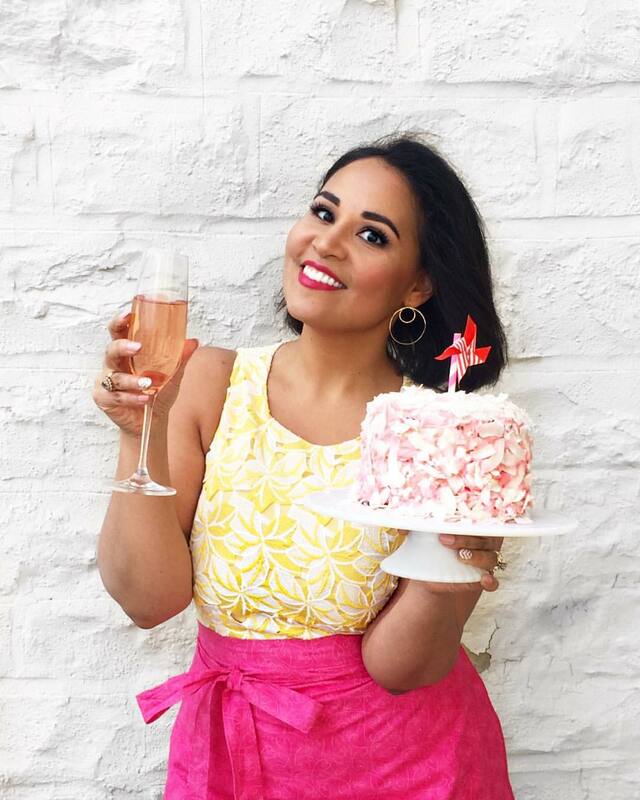 Thank you for supporting brands like Walmart that make it possible for me to provide you with new recipes and quality content!